Finder Keeper | Food and Drink | Style Weekly - Richmond, VA local news, arts, and events. 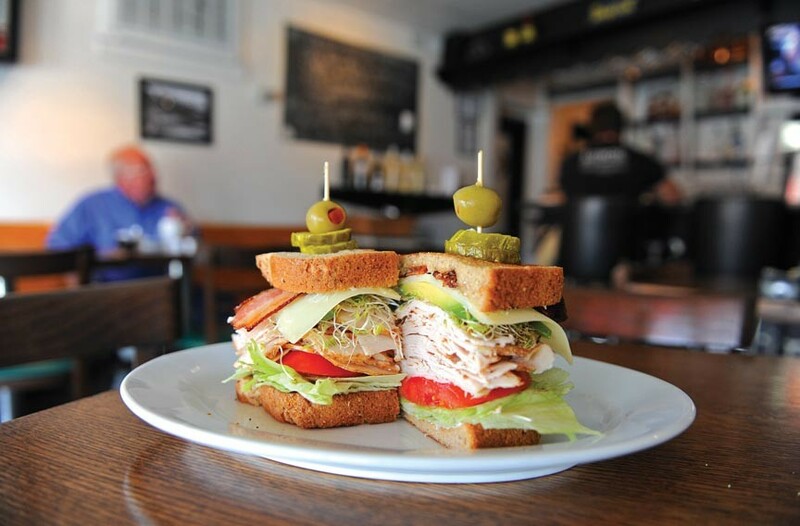 The Jimmy K has smoked turkey with avocado, sprouts, bacon, swiss and Duke’s mayo on multigrain bread. It’s named for Jimmy Koontz, who owns a body shop near Lunch in Scott’s Addition. It only takes one restaurant to turn a little-known neighborhood into a dining destination. How many people even knew where Carver was before Black Sheep opened? Yet during the past few years, people from across the area have set their sights on the little restaurant that can, guaranteeing long waits for creative food in a small space. Now that city diners have mastered Carver, perhaps it's time to look west to Scott's Addition and another little restaurant, one that sits in the shadow of the WTVR-TV 6 tower. It has the potential to put this obscure neighborhood on the radar of anyone who likes well-priced and well-prepared food. Four visits in, I can see it coming. Located in the former Sue's Country Kitchen, Lunch is tiny — just 24 seats. The formerly tired-looking Sue's has been spruced up simply and invitingly with wooden tables and vintage, black and white photographs of Richmond. Music seems to be chosen to fit the meal, and because Lunch serves breakfast, lunch and dinner, you might hear poppy '80s at breakfast, '60s R&B at lunch and Nina Simone at dinner. A long happy hour from 3-7 p.m. offers $3.50 wine and $2 Pabst Blue Ribbon, making it easy to slide in under the happy-hour wire to stay for dinner. Brunch lovers have the luxury of ordering breakfast until 3 p.m. daily. Meat's a treat. The thickly sliced pecan-wood smoked bacon, the hot homemade sausage and Taylor ham ($2 each) make breakfast a standout. Scrapple is on the menu, but when we have it the recipe is still being tweaked and not quite there yet. Pancakes ($6) are huge but light and we take a chance on ordering the french toast ($6), usually made with Texas toast, on multigrain bread. We're delighted with the toothsome heartiness of the substitution. With lots of syrup and butter, the three thick slices are too much for one person. Caffeine fiends should note that the coffee is Lunch's blend, courtesy of Lamplighter. Lunch is on Summit Avenue, so the Summit name shows up all over the menu, including a specialty omelet made with free-range eggs, homemade sausage, onions, peppers, tomatoes and Tillamook cheddar ($8). Whole grain biscuits are so good that a little girl at the next table proceeds to lick hers once she's full, unwilling to stop enjoying them. Naturally a place called Lunch excels at sandwiches. The Ike ($8) — albacore tuna salad with lettuce and tomato — is a thick sandwich executed simply and well. No fancy ingredients, but when you're in the mood for a tuna sandwich, this is it. The Lyons den ($8.50), named for co-owner Rick Lyons, pairs thinly sliced roast beef with swiss cheese and caramelized onions on a challah roll for a heaping serving of sweet and salty dipped in au jus. Sandwiches come with chips, but deviled eggs, coleslaw and Mediterranean pasta salad are available for $2. A spinach salad with more of that bacon, tomato, hard-cooked egg and red onion is enhanced by a separate dish of bacon dressing served hot. Lunch P.M., also known as dinner, is a showcase for pig. We start with the farm table sampler ($9), an array of bacon, seasoned pulled pork, sliced roast beef, Tillamook cheddar, swiss cheese, pickled vegetables, whole grain mustard and flat bread, sort of a Southern ploughman's platter. Southern bacon and corn griddle cakes ($10) are topped with a mound of pulled pork and coleslaw, with swirls of barbecue sauce on the plate. Monument shrimp and grits ($12) arrives with the shrimp wrapped in bacon over stone-ground cheese grits. The Summit shows up yet again, this time as crab-cake medallions over bacon and corn griddle cakes with sriracha aioli ($13). Considering Lunch's size, don't bring 10 of your closest friends and expect to sit together. So far I've tried twice to order the only regular dessert, a Barq's root beer float, only to be told they were out of ice cream. Tables are close together, so you will overhear other people's conversations and see their licked biscuits. Monday-Friday 8 a.m.-10 p.m. except no Monday night dinner.